I've always been one to learn from my mistakes. Okay, not always. But I did learn from my O'Reilly Raceway Park incident and I did not wear my 4-inch heels to my first outing to the Brickyard 400 at Indianapolis Motor Speedway. If you've never been to the NASCAR race at the famous track in Speedway, Indiana, take my advice. You should. At least once. Since you probably have already heard who won the race, not my guy No. 33 Clint Bowyer, who won the most money and who crashed, I'm going to tell you about the other activities. With a family friendly game area for kids and a beach area for kids of all ages, the racetrack has made it an all-day event. Coolers full of food and cold drinks, shorts, sandals, beach balls and sunscreen kept everyone in a festive mood throughout the hot, humid day. Besides the normal fair-style food, live music and events over by Turn 3, there was something I've never seen before or even heard about. It's one of those you've-gotta-see-it-to-believe-it kind of things. No, not the winner's obligatory lipsmacking session at the winning line. Regular people, bending over and playing kissey-face with the brick lin e outside the Pagoda. Quite a popular past-time it seems. Local and out-of-towners were getting their pictures taken bent over, tush in the air (ZZ Top would have been delighted) getting friendly with the walkway. So, I took a few photos of my own, including John Davidson and soon-to-be son-in-law Jim Cooper. Did I kiss the bricks? Well, I always did like trying out new experiences. Maybe next year...if Clint Bowyer wins. Elizabeth J. Musgrave is a syndicated columnist, travel writer and theater critic. You can catch her on WIBC Saturday mornings as Indy's Arts & Entertainment Adviser and follow her on Facebook, Twitter and at gottago.us. Comments can be sent to elizabeth@gottago.us. Gotta Go is published in the following newspapers: South Sider Voice, West Side Community News, West Indianapolis News, Pendleton Times-Reporter, New Palestine Reporter and Fortville Reporter. 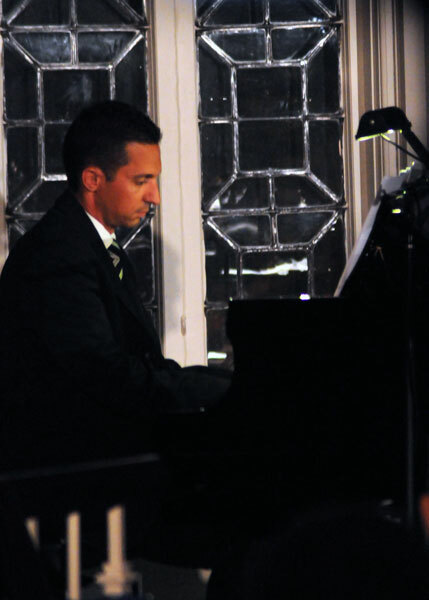 I had a chance to hear the mellow singing style of Roger Schmelzer at The Cabaret at The Columbia Club Saturday evening. 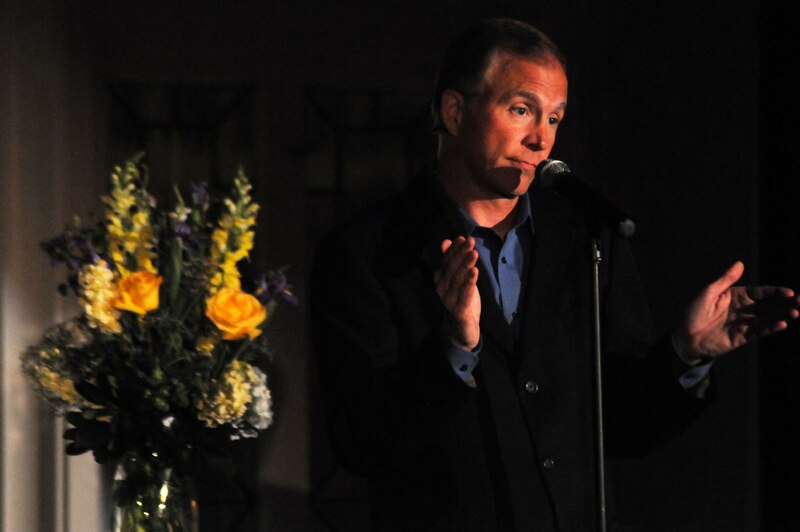 Schmelzer, an Indiana native, recanted his love life’s ups and downs in Heartsongs: A Playfully Romantic Cabaret. Intermingled with the tale were excerpts from his CD, about now, and standard favorites such as Bewitched and What are You Doing New Year’s Eve? The audience enjoyed his laid-back style and self-effacing jokes as Schmelzer took us through time, from the angst of his teen years to his current matrimonial bliss. Adding to the story was the fact that he had met his wife while at The Cabaret, bringing it full circle. 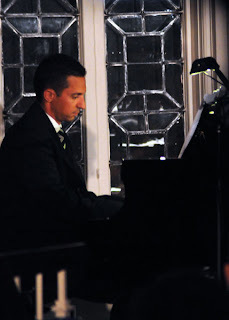 Accompanying Schmelzer on piano was Mark Timko who received well-deserved appreciation from the audience for his solo, My Funny Valentine. Schmelzer, seeming more relaxed in the second set, showed more of his playful side and enthusiasm the longer he entertained. Bringing to the top that which lingered just below the surface throughout the evening would have catapulted this show to the next level. Certainly the audience seemed eager to see his quirkier side and hear more of his tales. This reviewer would encourage Schmelzer to unleash the simmering fun side and allow himself, and the audience, to enjoy the full force of his humor. Coupling that suggestion with fewer quiet songs and a few more rowdy-comical love songs would provide the audience with a broader view of his talent. I was recently invited to be a judge at Bravo restaurant's annual Chef Cook Off, regional division. 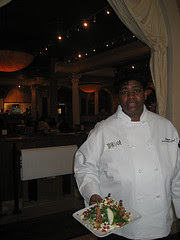 Held at the Greenwood, Indiana location, I was to eat every dish made by every chef and then judge. Supplied with a nice glass of Pinot Noir, I felt up to the task. 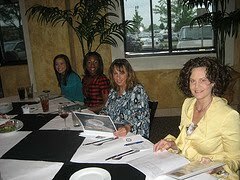 Our panel of four judged in categories such as taste, appearance, whether the dish was in keeping with Bravo's style and presentation. We nibbled our way through various dishes, all rather tasty. However, only one chef could win and that one person was Cassandra Presley from New Orleans. 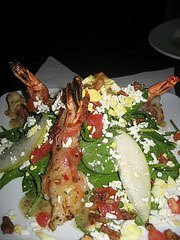 Presley's winning dish was Prosciutto-wrapped Shrimp Salad with a spicy caper vinaigrette. Key ingredients which helped to push Presley over the top were spicy pecans and the addition of pear quarters. Surprising to the panel was the fact that Presley had been with the company less than a year. Her win lifted her to the next round to be held in Ohio. Other noteworthy dishes include "Corona Di Prosciutto" from Chef Micahel Minch. The dish, a crispy bread stick stuffed with prosciutto, was served marinara and a Gorgonzola cream sauce. Chef Demetrio Estrada's "Veal Saltimbocca" was made of veal, sage and prosciutto, braised in white wine. The addition of chopped tomatoes and mozzarella enhanced the tender meat. The winning chef in the championship round wins an all-expense trip to Italy to study Italian cuisine. The winning dish also holds the possibilty of being added to the regular menu at Bravo restaurants. Elizabeth J. Musgrave is a syndicated columnist, travel writer and theater critic. Follow her on Facebook and Twitter and catch her on 93 WIBC's Saturday Morning News Show as Indy's Arts & Entertainment Adviser. Send comments to elizabeth@gottago.us. *Originally published in the following newspapers: West Side Community News, West Indianapolis Community News, South Sider Voice, New Palestine Reporter, Pendleton Times Reporter and Fortville-McCordsville Reporter. Grammy-Award winning crooner Michael Buble sauntered into Indy for a one-night-only performance June 29 at Conseco Fieldhouse. With a stage setup and orchestra worthy of a Vegas headliner, the crooner declared the event to be a party, relea sing beach balls and confetti throughout the show. Both his latest, and No. 1 ranked, CD Crazy Love, and the like-named tour seem to be about proving he is more than just a "rat pack" imitator. Stepping out from behind the shadow of Frank Sinatra and company, B uble's biggest response from the audience came when he slid into his own smash hits including Everything, Home, and newest hit single, Haven't Met You Yet. Noteworthy front act Naturally 7 received its own standing ovation for its rendition of Broken Wings and While My Guitar Gently Weeps. The a capella group, which became a sensation after a performance on a Paris subway platform was posted on YouTube, also performs with Buble on his latest CD. Touring the world on a fast-paced, grueling schedule, Buble took the time to pack, along with his famous 80 suits, his happy-go-lucky attitude, holding nothing back from the ticket holders. Perhaps that’s the secret of his obvious success. The ruggedly handsome Canadian with the boyishly impish charm promises his admirers to always, "give so much more than I get." His working man's outlook on giving everyone their money's worth at his show, along with his heartfelt speeches throughout the performance, endears him even more to his fans. This causes confusion for me. Upon showing his fans so much respect, thanking them for their loyalty and crediting them with his rise to fame and fortune it seems odd that he would then disrespect the same group of people with offensive locker room language and humor. Certainly a man able to create such beautiful lyrics should understand his romantic, poetic side is what draws people to his concerts and the music stores. Can he not refrain from unnecessary, and inappropriate, bar room antics for two hours? Aside from the awkward comments, Buble’s performance ran at full speed, with the singer intermingling with the crowd while covering standards and contemporary tunes. The song list was wide-ranging, allowing fans to enter his world, from childhood through his adult years. Besides his own hit singles, Buble also covered standards, such as All of Me and Mack the Knife, and personal favorites including, Heartache Tonight, At This Moment and Twist and Shout. Bottom Line: Michael Buble, the hardest working performer currently on tour, turns in an A+ performance of high energy, sincerity and quality. Prerequisites for attending a Buble performance: a party attitude, a willingness to join in and an inside aisle seat. *This column was originally published, in the following newspapers: South Sider Voice, West Side Community News, West Indianapolis Community News, Pendleton Times-Reporter, Fortville-McCordsville Reporter and New Palestine Reporter.